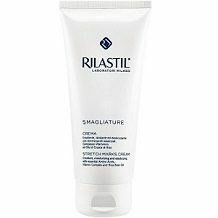 Today we are reviewing Stretch Mark cream, by Rilastil. That said, stretch marks can be ungainly and bothersome, especially if they’re in obvious area like your hips and tummy or even lower inner thigh. When skin stretches too much, it loses collagen. Collagen is what gives skin is firmness, elasticity and plumpness. Genetics can also play a role, and a lack of hydration is also detrimental to stretch mark-free skin. So as the name suggests, your skin stretches. But when does this happen? During pregnancy, when you’re experiencing hormonal changes such as puberty and menopause, and during normal growth spurts. This could include when you gain weight, especially rapidly, only to lose it suddenly. The more this expand-contract cycle happens, the greater the chances of stretch marks. Ginkgo Biloba and Arginine are as good for the brain as they are for the skin. That’s because they radically slow down the rate at which cells age on a mitochondrial level, especially the elasticity of the walls. They would therefore help to slow down and restore firmness and plumpness. The vitamin complex would also mean that this cream should have a strong anti-oxidizing and eutrophic action, preventing the onset of new marks. Apply in the morning and in the evening and massage across the stretch mark area until it has been absorbed. Apply twice a day during all potentially affected areas during pregnancy, and resume 3 months after you have your baby. None mentioned. Speak with your healthcare professional before using. It retails for $49.67 on Amazon. You are paying for 6.7 oz of cream. There don’t appear to be bulk discounts. We could not find a returns or guarantee policy. We liked that the cream is dermatologically and microbiologically Tested; Nickel, Cobalt, Chrome, Palladium and Mercury Tested, as well as clinically tested (but the manufacturer does not however provide evidence of these clinical tests). It is also parabens free and Hypoallergenic. The manufacturer does not provide a description of constituent ingredients and how these are synthesized, or work. In this day of consumer enlightenment, that is both seemingly arrogant and strange, as consumers love being informed and moreover need to be. You cannot simply market your product as a cream that will produce amazing results without explaining the basis for your claim. In today’s terms, that is little more than dummy marketing, even if your ingredients do happen to be superior. Many of the ingredients one would expect to see are missing – and you would expect to see them precisely because they work, and have done so for decades in various formulae. Given that to top it all, there appears to be no returns policy for what is an expensive cream, we are reluctant to recommend Rilastil.